It’s that time of year for school to be back in session and your kiddos need to be well fueled for the school day. Start the day strong by powering up with breakfast. Breakfast sets your child up for their whole day. Instead of sugary cereals, pastries, and processed foods, try yogurt with fresh fruit, peanut or almond butter spread on whole-grain toast or on a banana, add chunks of fruit to a bowl of whole-grain cereal or oatmeal, or make scrambled eggs spiked with veggies. Time an issue? Send them off with a baggie of homemade trail mix to nibble on in the car or on the bus ride to school. Pack a power lunch rich in variety. Include a mix of food groups: some grains, some fruits, some veggies, some meat or protein foods, and some dairy options. 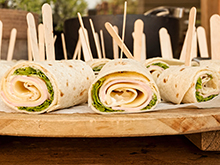 Stuff whole-grain wraps or pita breads with vegetables, cheese, and lean deli meats. Use prepared hummus, flavored mustards or light mayo as a spread. Whole-grain breads or tortillas can be spread with nut butters and topped with sliced fruit like bananas and apples. Soups can be a great way to incorporate a variety of veggies, lean meats, beans and whole-grain pastas or brown rice. Use low sodium broths or tomato based versions. 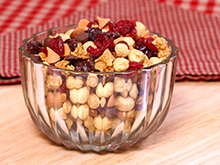 Make your own trail mix: Combine dry whole-grain cereals, dried fruits and unsalted nuts or seeds. Fruit — nature’s sweet treat! Pack fresh tangerines, bananas, grapes, apples, oranges, peaches or canned versions of fruit packed without added sugars. Veggies — load sandwiches with sliced tomatoes, spinach or romaine lettuce, sprouts, sliced peppers, avocado, etc. And, baby carrots and celery sticks make for easy side options. Quench their thirst with water. Whether the water is pure and plain, or sparkling with natural flavoring, it’s a source of healthy hydration without the empty calories of sugar sweetened beverages. Other healthy beverage options include milk and 100% fruit or vegetable juices. One way to help your kids pack and eat a healthy lunch is to get them involved in making it with you. Try one of these easy to make recipes to get started. This sweet and salty treat makes a great school lunch option that kids can help make themselves. 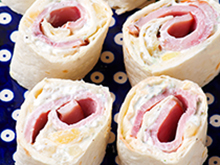 You’ve got school lunches wrapped up with this easy to make — and fun to eat — wrap. 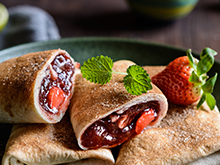 Making these tasty treats with your kids will be a smash hit! 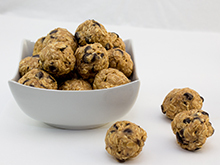 These easy-to-make bites will give you and your kids the energy you need to get through the day. This tasty trail mix is an easy way to introduce your kids to measuring and stirring. Kim serves as the dietitian for the Center for Healthy Lifestyles at OSF HealthCare St. Joseph Medical Center. She holds a bachelor’s degree in dietetics/nutrition from Iowa State University, as well as a master’s degree in public health administration from Drake University. She has promoted health and wellness through conferences, workshops, publications, radio, television, and educational videos. Kim presents nutrition and health topics throughout the community at schools, businesses, community organizations, support groups, conferences, and via local media.